Southern California is still healing from a historic drought. Yet most people take clean, affordable water for granted because it continues to spout freely from our shower heads and faucets, said Charley Wilson, President of the Southern California Water Committee, at a recent California WaterFix Summit. During a panel discussion at the Summit, water experts agreed that Governor Jerry Brown’s proposed California WaterFix tunnel project will help hedge against predicted losses of water from the Sacramento-San Joaquin Delta, but will not yield enough water supplies to meet new development demands. “My County Supervisorial district has been growing faster and that creates a need for water, and that’s why we’re here,” said Marion Ashley, a Riverside County Supervisor, at the event. Water experts gathered at the San Gorgonio Water Pass Agency headquarters in Beaumont recently for the California WaterFix Summit to discuss the importance of water supply in meeting the needs of future development in the region. The WaterFix Summit, held Nov. 17, drew more than 50 water leaders, developers, and residents from throughout the region to the San Gorgonio Pass Water Agency headquarters in Beaumont. It was sponsored by the Southern California Water Committee, a nonprofit, nonpartisan organization dedicated to informing Southern Californians about water needs and the state’s water resources. The $17 billion WaterFix project is designed to modernize the state water system to improve water supply reliability in Southern California. About 60% of the water that flows out of the taps in Beaumont, Calimesa, Yucaipa, and Cherry Valley comes from Northern California through the fragile Sacramento-San Joaquin Delta. Jeff Davis, General Manager of the San Gorgonio Pass Water Agency, emphasized the importance of long-term planning to meet future water supply needs. “The development community needs to step up and figure out how to pay for the additional water supplies we need to provide for the new homes they want to build,” he said. Jerry Johns, who has worked in the water industry for 40 years, addressed potential sources of water. “Central California farmers are a potential source of more water, but they are savvy business people,” said Johns, a former official with the Department of Water Resources and an expert in water supply and transfers. Headrick added: “During a recent dry year the going spot market rate for water transferred to Southern California was as high as $2,500 an acre-foot.” An acre-foot is enough to supply two households for a year. Developer representative Mike Turner, an audience participant, observed that wastewater treatment plants could add recycled water to support new homes. David Armstrong, General Manager of South Mesa Water Company, responded to Turner’s comments. 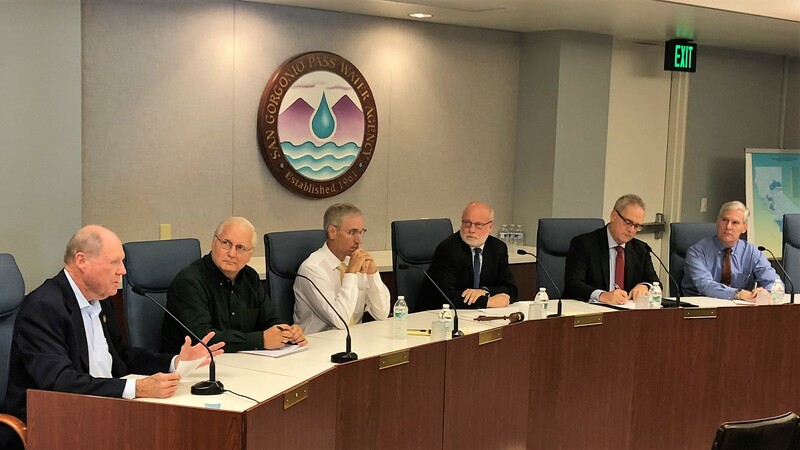 “Yet, close to 2 million gallons of recycled water currently produced at a treatment plant in Yucaipa is flowing into the San Timoteo River towards Orange County every day, instead of our own groundwater basins,” Armstrong said. SCAPE Landscape Architecture has released renderings and images of PUBLIC SEDIMENT, a living infrastructure proposal for the San Francisco Baylands that will invest in marshes and mudflats to buffer vulnerable communities and ecosystems from the threats of sea level rise. PUBLIC SEDIMENT is developed for the Resilient by Design Bay Area Challenge, a design competition that brings together local residents, public officials, and local, national and international experts to develop innovative solutions to the issues brought on by climate change in the Bay Area. PUBLIC SEDIMENT is developed by a multidisciplinary design team that views sediment as a core building block of resilience in San Francisco Bay. The team is led by SCAPE Landscape Architecture with Arcadis, the Dredge Research Collaborative, TS Studio, the UC Davis Department of Human Ecology and Design, the UC Davis Center for Watershed Sciences, and the Buoyant Ecologies Lab. Our team, Public Sediment, proposes to invest in ecological infrastructure and its protective value. Yet the Bay area’s ecological infrastructure- its marshes, mudflats, and coastal edges- are at risk. The slow and methodical subsidence of the Bay’s tidal wetlands is a catastrophe of tremendous proportion not just for ecosystems, but for communities. Combined with sea level rise, this subsidence exposes hundreds of thousands of residents and the region’s critical drinking water, energy, and transportation infrastructure to tremendous risk. To creatively adapt to this challenge, our team proposes to focus on sediment, the building block of resilience in the Bay. Our team proposes to actively intervene in this ecological transformation by DESIGNING WITH MUD. We propose to connect the uplands and the lowlands with a series of sediment actions. We will harvest and retrofit dams, unlock tributary channels, and test new methods of mud placement that use currents to effectively move sediment in the Bay. But this is not enough. We must MAKE SEDIMENT PUBLIC. To do this, we propose a series of connective paths, outdoor mud rooms, and sensing stations, that link vulnerable neighborhoods with the Bay and engage youth in monitoring of the environment—visualizing climate change in their backyards. We propose three scales of PUBLIC SEDIMENT, each framing a distinct action to catalyze social and ecological resilience, with mud, in the Bay. These projects are called: Pilots for a Future Bay, the Bay Cushion, and Unlock Alameda Creek. PILOTS FOR A FUTURE BAY proposes four distinct pilot projects that advocate for joint regulatory change and physical experimentation. We aim to engage middle schools around the Bay, working with our next generation of environmental stewards to design and monitor small-scale experiments that can shift the physical trajectory of the baylands. THE BAY CUSHION values and design the ongoing South Bay Salt Pond restoration project as living, protective infrastructure that reduces the tidal extremes around the entire bay. Yet restoration goals may not be achievable with sea level rise and low sediment supply. We propose to model and study new forms of bay cushions for reduced flood risk, but also for sandpipers, leopard sharks, steelhead, and marsh mice. We aim to MAKE SEDIMENT PUBLIC in the South Bay by creating a sediment reserve that links ecosystem and human benefits, and creates viewing towers, outdoor mud rooms, and sensing stations that extend out from the existing Bay Trail. UNLOCK ALAMEDA CREEK. At the tributary scale, we propose to unlock the sediment flows of Alameda Creek. We will focus our efforts on redesigning this waterbody to bring sediment to the baylands, reconnect steelhead with their historic spawning grounds, and organize a tributary-based network of community stewards that physically connect to the Bay. A network of paths, mud rooms, sensing stations, and fish ladders enable inter-species interactions along the creek, building empathy and capacity for a new sediment public over time. PUBLIC SEDIMENT is developed by a multidisciplinary design team that views sediment as a core building block of resilience in San Francisco Bay. The team is led by SCAPE Landscape Architecture with Arcadis, the Dredge Research Collaborative, TS Studio, the UC Davis Department of Human Ecology and Design, the UC Davis Center for Watershed Sciences, and the Buoyant Ecologies Lab.